It is so refreshing to be sent a product claiming to be 100% non-toxic that actually is! No need to hunt for chemical ingredients hidden. No need for background checks! The story behind [amazon_link id=”B0073LGECW” target=”_blank” ]Molly Suds[/amazon_link] is one familiar to our readers. It’s the moment we woke up to the chemical world we live in and became scared. Most of us become scared enough to simply switch products. Molly Suds decided to make them! The idea for our company came in 2006 when I read something on the internet about BPA (bisphenol A). It was at that moment that I wondered why I never looked into chemicals before and how I thought organic food and meat was so necessary but organic chemical free shampoo… I barely gave it a thought. Sure I would buy a name brand “all natural” product here and there, but it was more for fun, and now I know most were NOT truly all natural. I went around the house grabbing the bottles of moisturizers and mascara and shampoo and started researching the ingredients, I was horrified to see what research was and was not out there. There are 80,000 chemicals used in the USA and only 200 have been tested for human safety, and of those only on men, not women or children! Did you know that Canada and Europe have banned many of the chemicals we commonly use in our household products because of their human toxicity? I’m talking about the chemicals in our baby shampoo not just our toilet cleaner. Interesting, yes? Do you ever wonder why the cancer rate is so high and why neurological, endocrine and auto immune disorders are at an all time high? Is it because we are just noticing it and diagnosing it more, maybe that is a small part of the bigger picture. It is undeniable that there is overwhelming evidence of the chemicals and pollutants in our environment, food and bath, body and cleaning products that are contributing to disease, cancer, disorders and infertility. We typically use [amazon_link id=”B00120VWJ0″ target=”_blank” ]Dr. Bronners[/amazon_link] for washing our dogs, and boy do they need baths! I love how Molly Suds tells you to end your dog’s bath with a hug! 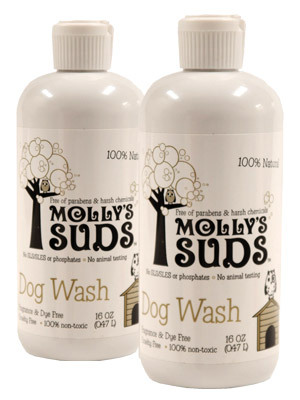 These products are made in the USA, but Molly Suds goes one more step. All of the ingredients are also sourced in the USA. For example, the sports wash is made from “Proprietary blend of purified water, coconut oil, organic alcohol, essential sweet orange oil, minerals and enzymes derived from edible seed and bearing plants”. Normally, I get concerned when I see the words “proprietary”. I can’t help but think of the chemicals involved in fracking. I am not so worried when I see the words used by Molly Suds. Seriously, you can’t go wrong with Molly Suds!